There’s a chill in the air and the pine forests of Mt Macedon (and craft beer) are calling. 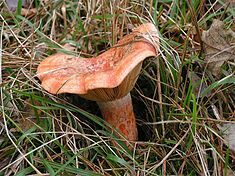 After the rains the forests come alive with delicious saffron milkcap mushrooms. A ride in the forest and a hot lunch of fried mushrooms and crusty bread is just the thing for autumn. Bring goodies for a lunch (garlic, butter, oil, crusty bread) and a cup and plate to eat from. Ride around 30km (of sometimes hilly and unsealed roads) from Gisbourne to Woodend via the Macedon Regional Park. A beer at the http://www.holgatebrewhouse.com/ before catching the train back to Melbourne.